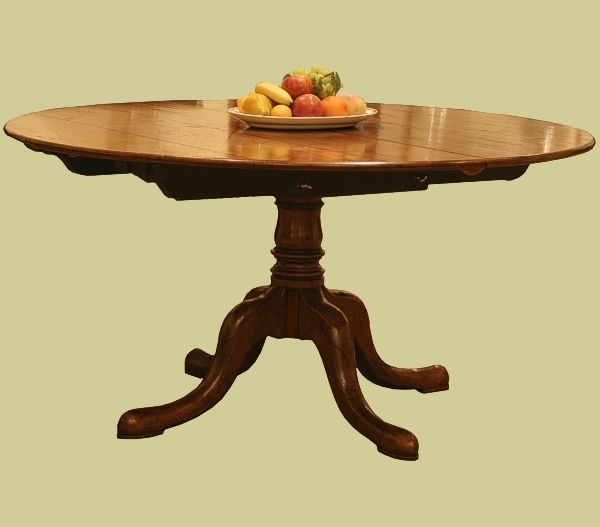 Circular extending dining table, on a pedestal base. Handmade from English oak and one example from our Wilmington custom made circular dining tables range. Being bespoke, you can adjust sizes according to your requirements. This size of table (152.5cms diameter), closed, will make a comfortable 4-6 seater and, at a squeeze, an 8 seater. With the loose leaves inserted it makes a comfortable 10 seater with 12 being an absolute squeeze. There are supporting legs, either end, which stabilise the top when it's extended and these fold up out of site when not in use. Also available as a 183cms (6ft) diameter, extending to 274 cms. With this larger size we use a pair of drop down supporting legs either end, connected with a stretcher, to provide essential additional support when the table is fully extended. As a round table, this size will seat up to 8 comfortably and 10 at a squeeze, and with the extension leaves in, up to 12 reasonably comfortably. See drop down box below for prices. To view a bespoke version of this table in our clients home click: Colour Matched Round Pedestal Table and Bespoke Colour Pedestal Dining Table. And another bespoke size version at our Sussex clients home: Extending Oval Pedestal Table in Downland Village House. Also: Round extendable oak table & ash chairs in Sussex farmhouse and the same table extended: Extended pedestal table & ladderback chairs in farmhouse.